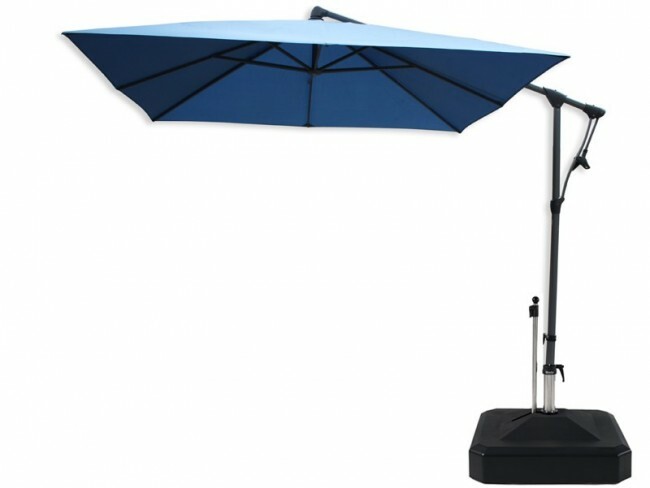 An elegant and functional 2.6m x 2.6m Square Parasol. The Sunwing C+ crank and tilt mechanism can pitch 90 degrees either side. Designed with unique extension rod ends to ensure there is maximum canopy tension and performance. Canopies are scotchgarded, with a fade resistance. The movable base has 120kg granite inserts totalling 150kg. The lever raises the weighted base allowing it to move across your patio. Once the parasol is in the correct position, simply release the lever to lower the base. Aluminum anthracite grey powder coated frame creates a modern clean look. Protective cover with zip and rod included. The price includes delivery and set-up.